Ask yourself…What kind of crafter are you?Do you only craft away from home? – Maybe you’re Mary Mobilmaker. Do you always craft at home? – You’re Cathy Craftroom. Do you store everything hidden away from your workspace and bring things out when you’re ready to work? Could you be Karen Kraftabout? Do you have a craft room, but also attend crops and classes – You might be Sophia Cropalot. Learn more about the type of crafter you are and the types of tools that might work best for you. Fab Files are ideal for crafters who need to store their products away from their workspace. The small label on the side of the box is perfect for creating a “library” of embossing folders (and other products, too). Fab Files are small and lightweight. Carry them to your workspace and easily flip through them to find the perfect one for your project. Available for both 4×6 and 5×7 embossing folders. Are you a crafter who always (or regularly) travels with your craft supplies? 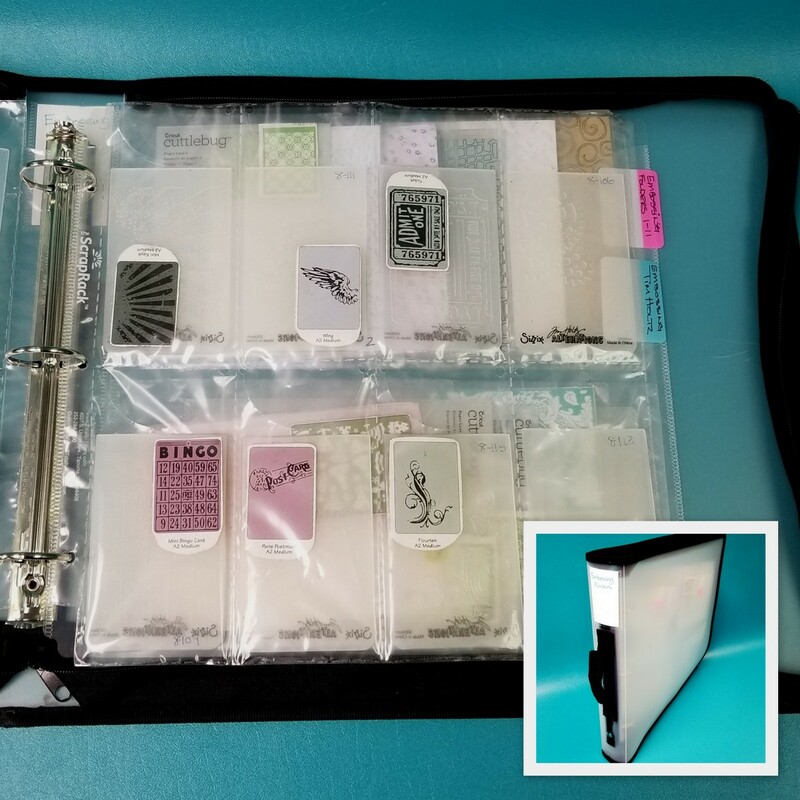 Consider using a 12×12 Craft Binder with ScrapRack Storage Pages to store your embossing folders. Choose the best pages for your variety of embossing folders – Straight Eight, Trader’s Twelve, Fantastic Five, or the Flippin’ Storage page. The Flippin Storage BinderThis binder is a more traditional size, so it’s easy to store on a shelf or in a cupboard. The Flippin’ Storage Pages that are included with the binder have 5 pockets on the front side, each is 4×6, and 5 pockets on the back side, each is 5×7 – ideal for embossing folders. Die, Stamp & Supply OrganizerDo you always craft at home? The Desk Maid Die, Stamp, & Supply Organizer will hold up to 100 embossing folders – all of them visible and accessible. The sections in the Die, Stamp & Supply Organizer are adjustable to fit perfectly with your embossing folder collection. If you’ve read any of my other articles or watched my videos, you know I’m a HUGE advocate for cataloging your tools. A tool catalog could include embossing folders, dies, stamps, punches, etc. (Learn more – read, Why create a catalog of your tools.) I would strongly advise the catalog option if you have or intend to have more than 25 embossing folders. If you’re new to cataloging, you’ll need to create a themes and sentiments list before you get started – learn more. If you choose this method, gather your embossing folders together and sort them into piles based on category theme, sentiment, or holiday. Generic patterns belong in the themes category “backgrounds”. Add a label to each category and store the embossing folders in whichever storage container best fits the type of crafter you are. It seems counterintuitive, but the first step in creating a catalog is filling your storage containers. Once the containers are full, assign a number to each embossing folder in the container. Using your themes and sentiments list, create catalog pages – Learn more. Remove each embossing folder from the storage container, create an impression on the catalog page. You can use a crayon to create a rubbing directly onto the page, or you can create an actual sample by running the folder through your machine and then attaching the sample to the catalog page. You will want to create multiple impressions for embossing folders that fit into multiple categories, i.e., Anna Griffin’s Christmas Embossing Folder – this would fit in 3 categories, backgrounds, Anna Griffin, Christmas. Add the impression(s) to the appropriate page(s) of your catalog. Add the number you assigned to the embossing folder to the impression on the catalog page(s), then return the embossing folder to the storage container. Continue this process with each of your embossing folders. Cut the image of the embossing folder design off the packaging. If it’s a thin piece of paper, run it through your Xyron machine and stick it directly to the embossing folder. If it’s thicker – chipboard type, “hinge” it to your embossing folder with a piece of tape. This will serve as a sample image so you don’t have to decipher the design by looking at the folder itself. By “hinging” it, you can flip this piece away from the folder when it comes time to use it, so as to not leave a blank impression in that spot. If you were unable to get an image of the embossing folder packaging, you can always create an extra rubbing and include it with the embossing folder where it is stored. In this case the orange tint of the embossing folder makes the design almost impossible to discern, so the rubbing example is really helpful. In this example (below), I used the Flippin’ Storage Binder to organize 30 embossing folders. I gave each pocket the same number as the embossing folder. I also labeled the tab on the storage page and added the numbers contained in the binder to the exterior label on the binder. Check out this YouTube Video with all the details! Please do visit our website – Totally-Tiffany – to learn more.